Graduate and professional school programs sometimes earn additional or advanced program accreditation. Generally, a school or degree program is accredited by a professional organization in the field that officially recognizes the program as meeting essential requirements, such as academic excellence. For example, if you want to become an attorney, it is advantageous to go to a law school accredited by the American Bar Association. Interested in becoming a librarian? Attend a library science program accredited by the American Library Association (ALA). The same is true for doctoral programs in clinical, counseling, and school psychology. It’s important to choose a degree accredited by the American Psychological Association (APA). 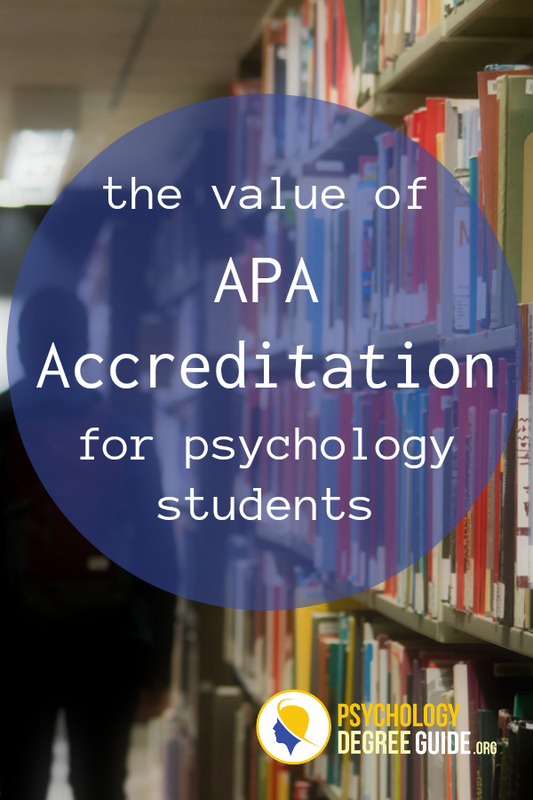 What does APA certification mean? The APA Commission on Accreditation (CoA) accredits doctoral programs in clinical, counseling, and school psychology, as well as predoctoral internship and postdoctoral residency training programs in accordance with published guidelines and procedures. Students can also be confident that such programs will offer a certain level of supervision, and appropriate supplemental resources, such as libraries, computers, and office space. What are the advantages of APA certification? Accreditation gives students a measure of assurance that they can get a return on their educational investment. In many states, graduating from an APA-accredited school is required for licensure. Graduating from an APA-accredited school will also open more opportunities for jobs and for membership in professional organizations. For example, to become a member of the APA, one has to be a qualified professional in psychology with a doctoral degree in psychology from an APA-accredited school or a related field from a regionally accredited graduate or professional school. How do I find an APA accredited school? A list of all accredited programs can be found on the APA’s website. The site also includes information on how to choose a program, frequently asked questions about accreditation and specialty information. In addition, every December in the American Psychologist journal, the APA publishes its most recent listing of programs and their accreditation status. It is best not to apply to a school listed as being “on probation.” If it indicates a particular program is pending, it is wise to contact the department head and discuss where they are in the process. For those interested in studying online in a hybrid program, Fielding Graduate University’s PhD program in Clinical Psychology is the only such doctoral program accredited by the APA. In order to meet APA residency requirements, students attend monthly meetings in their geographic region and one to two week long residential sessions per year. American Psychological Association (APA), retrieved 2 April 2010. The American Psychological Association of Graduate Students (APAGS), retrieved 2 April 2010. Vaughn, Thomas J. ed. (2006). Psychology Licensure and Certification: What Students Need to Know. Washington, DC: American Psychological Association. Sayette, Michael A., Mayne Tracy J. & Norcross, John C. (2010) Insider’s Guide to Graduate Programs in Clinical and Counseling Psychology: 2010/2011 Ed.New York, NY. The Guilford Press.